And by strange, we don't necessarily mean bad. In addition to being an opportunity for brands to unveil their new collections, the runway has also become a place to show off (hopefully) buzzy new collaborations with other brands or, in some cases, the products of a sponsor. Often, those collaborations make a lot of sense in terms of synergy, or are a smart way for a brand to extend into a different market or become exposed to a different audience. Opening Ceremony’s partnership with Intel at New York Fashion Week was pretty cool, as was Tome’s with jewelry label Lizzie Fortunato. Other times, they leave us scratching our heads. Again, this isn’t necessarily a bad thing — sometimes they yield cute, if a bit useless, results. We were surprised, for instance, by how omnipresent Barbie was this season, both in New York and Milan. 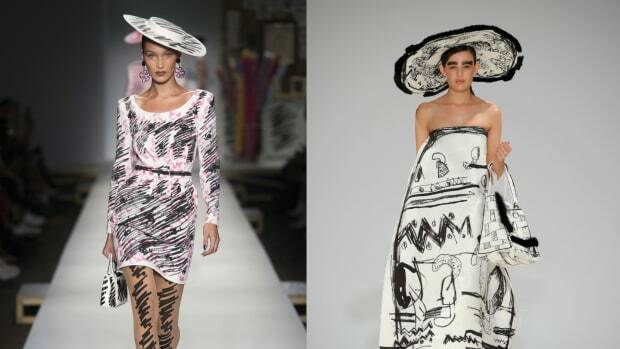 Elsewhere in New York, a bunch of designers created looks for Snoopy, somewhat inexplicably. There were also a number of wearable tech collabs, some of which worked better than others. Read on for the oddest collabs to come out of New York, London and Milan.